Sambusso is a fried phyllo-like triangle pocket filled with spicy ground beef. Buticha, tibs and gomen may not be in your everyday vocabulary, just yet. Buticha is a garlicky, chick pea dip; gomen contains collard greens; and tibs takes on chunks of marinated poultry, beef or lamb. Tampa’s Queen of Sheba is like a safari, a journey where you’ll embark on earthy, Ethiopian flavors. Found in a simple, south Tampa storefront, the eatery with its mottled, pumpkin walls, native textiles, and serving baskets called mesop, is about as far from western food as you can get. Ethiopian food is not blistery hot, although you can singe the eyelids when too much berbere, a famous red chili, mitmita, a chili with spices, or awaze, a fiery condiment, are applied. Its food is bold, colorful and infused with strong, spicy undertones that can provoke strong reactions. 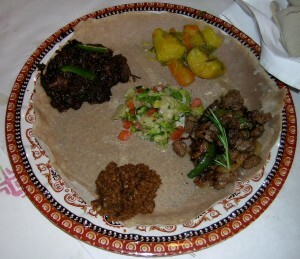 Injera looks like a spongy pancake and serves as an edible utensil for the stews. “We try to keep food pretty healthy and organic when possible,’’ says Yammy Makonnen, assistant manager. There’s no running out to a Piggly Wiggly for last-minute lemongrass syrup or lentils. Ethiopian cooks cannot deplete their stock with abandon and must be on top of the supply of signature staples. “We have so much trouble finding some ingredients that we must order them at least two weeks before we’ll need them,’’ says Yammy. On the menu are four appetizers. 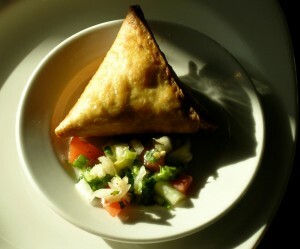 Sambusso, a fried phyllo-like triangle pocket filled with spicy ground beef or lentils, is brightened by a garlicky, pepper salad. Another choice is azifah, a lentil dish blended with diced onions, peppers and mustard. Sautéed boneless lamb, the Queen’s Lamb Tibs, brings onions, peppers and rosemary together. What’s not to like about wot? Mahogany strips of beef are simmered with sliced jalapenos for a spicy offering. The dishes arrived with spiced legumes and a carrot and potato medley, well seasoned with turmeric marking its distinctive yellow hue. For those who like steak tartare, kitfo is a finely chopped beef that never sees a flame. Should you not want it “traditional,” they will cook the meat to order. Vegans should have no problems here with so many offerings. One friend raves about the plentiful lunch buffet. For $10, it is all-you-can-eat with six dishes of chicken, beef and lamb and six vegetarian selections of carrots, collard greens, cabbage, green beans, chick peas, and more. The unusual selection makes her feel as if she has experienced another country on a one-hour work break. Our server was graciously polite but there were waits between courses and for the check. If the African music was turned down a tad, it would be even more felicitous. The staff is mostly casual. On one occasion, the server left two patrons to linger over lunch while she ran a quick errand. On another, the owner happily guided a bite of injera for a first-time patron by pulling off the bread with her fingers and placing it in the mouth of the surprised guest. After a few Ethiopian beers, one a lager and one heavier, it seems to make sense. Couldn’t agree more! It’s so much fun to eat here…it’s all healthy and so different from the same-old, same-old. I never get tired of Queen of Sheba! Sounds like a fun way to spend an evening. We will definitely give it a try! I crave the exotic. Thanks for a great tip. I went to Queen Of Sheba, the srevive was bad and the food was horrible. The waitress explain to me the plater she told me I would get 6 meats and I received 3 meats and the rest vegetables. The vegetables taste like it came out of a can. The portions were like a baby portion.